Email templates can be designed for use in different contexts. The creation of Email Templates is covered in the online documentation. In the image above you can see that templates can be designed for usage with certain entities. 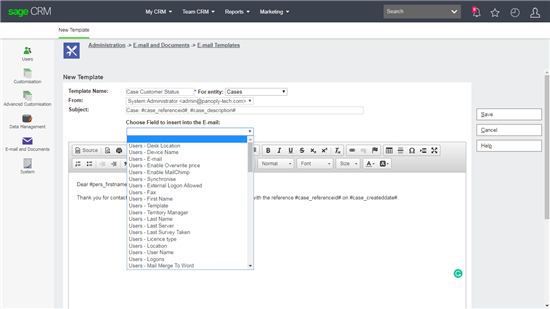 For example, if you choose to create the template for use in the Cases context, then a set of fields related to that entity will be displayed in the "Choose Field to insert into the E-mail: " drop down box, or you can manually insert the field you want by typing the merge codes for that field, e.g. #case_createddate#. The fields that available in each context depend on the views that are used. A view that provides information about the current user is always available but the fields available in the opportunity context will be different from the case context. Below are the all fields that are contained in the different views. Some fields may not pass values even if they are included in the view because of internal rules hardcode into the eware.dll. For example fields may be supressed because they would compromise system security (user_password) or may be restricted by other internal application rules. An example are the account fields which are only available in certain editions of Sage CRM that are integrated with some accounting systems. Note: The view used by emails in the Communication context is vCommunication as described above. Email Templates for Custom Entities only use vSearchListUser. So can one amend the above views to bring through new fields into email templates? I don't think you can. You are limited to the views used above. We had an email template in version 6.2 associated with the Opportunity entity that included the mobile phone number of the contact being emailed using #phon_countrycode# #phon_areacode# #phon_number# . I am struggling to do this in 7.1 - is there a way of doing this? I can get their phone number (#pers_phonenumber# ), but not their mobile number. Hi Mat, did you able to solve the issue?I am having same issue here.So solution either. Which phone number is used within the mail merge is down to the view that is used. You will need to investigate views like vcompanype and vpersonpe and how they are used by the views called by the mail merge. Is there a field for "Case Created By Email"? I want the ability to email the creator when they create a new case. I've tried putting in the #Case_CreatedBy# but it emails the creators name, not the email address. which method of webservice i can use and the table name needs to pass ? Thanks for the question. The SOAP webservices do not include methods that allow you to reference the email templates. The SOAP web services only provide methods to allow Create, Read, Update and Delete of records. They do not include interface generation capabilities (e.g screen building) or process control (e.g. workflow or internal e-mail client). I need to add some fields from another table to the choices for an Opportunity email. Therefore, I went to the view...vSummaryOpportunity and added a Left Join to this view with the data needed. Therefore, I am wondering Is it possible to add additional fields to the Opportunity email? If so, where can I go about editing the information to include the additional fields. Any assistance you can provide would be greatly appreciated! I have done a little check with Sage CRM 2017 R1. New columns that are added to the tables referenced in the views are recognised but derived columns are not and neither are columns from joined tables. Thank you! Based on what I am reading, you cannot modify the vSummaryOpportunity to add fields to choose from. If you want the fields to be included, they need to be part of the opportunity table. Is there any way around this? Is there a way to create my own view to be used and have it display in the list of choices the way to tables do?